Can Trump Work Out a Deal or Two with the Democratic Leaders of Congress? It is indeed difficult for any President to make an alliance with a leader of the opposition party in Congress to accomplish significant goals, but a number of Presidents since Franklin D. Roosevelt have been able to do just that, gaining the support of important leaders of the opposition party. Four Democratic Presidents and two Republican Presidents were able to accomplish major goals in domestic and foreign policy due to such alliances. Franklin D. Roosevelt was able to forge an alliance with many of the members of the small band of progressive Republicans in the US Senate to accomplish the major goals of the New Deal in the 1930s, as I report in my book, Twilight of Progressivism: The Western Republican Senators and the New Deal (Johns Hopkins University Press, 1981). This included such prominent luminaries as Nebraska Senator George Norris, Wisconsin Senator Robert La Follette, Jr., and California Senator Hiram Johnson. 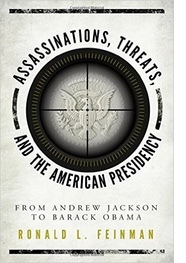 Only when the dangers of international conflict became the major threat in the late 1930s did LaFollette Jr. and Johnson abandon FDR, with only Norris, who had been an isolationist during World War I, remaining a loyal backer of FDR as World War II loomed. One must also remember that FDR often referred to the impact on his own progressive thinking of the senior Robert La Follette, who had been called “Mr. Progressive” for his impact on the nation in the first quarter of the 20th century; he’d been a third party candidate in 1924 (the Progressive Party), a campaign often called the forerunner of the New Deal in many respects. Harry Truman had to deal with an opposition Republican 80th Congress in 1947-1948, but was able to gain the support of a potential rival, Michigan Senator Arthur Vandenberg, the chairman of the Senate Foreign Relations Committee, as the Cold War with the Soviet Union began to emerge. Vandenberg was adept at gaining financial backing for Truman for his Truman Doctrine to aid Greece and Turkey against Communist insurgencies, and also the massive plan to rebuild Europe, known as the Marshall Plan. These triumphs allowed Truman to assert his leadership in foreign policy, even though Ohio Senator Robert Taft, a leader of the GOP, was vehemently opposed to Truman’s initiatives. Looking back, it is clear that Vandenberg’s strong support really made the difference in the evolution of American foreign policy in the late 1940s. Dwight D. Eisenhower worked very hard to get along with Democratic Speaker of the House Sam Rayburn and Senate Majority Leader Lyndon B. Johnson from 1955-1961, leading to the passage of the first two Civil Rights laws since Reconstruction, along with strong backing of Eisenhower on the space program and the beginning of a federal commitment to education (including the study of foreign languages, mathematics, science, and technology). Eisenhower never would have been as successful as he was without the backing of the two Democratic leaders, who led a Congress with a majority of their party in both houses. Ike, Rayburn and LBJ became engaged in “schmoozing” on a regular basis. 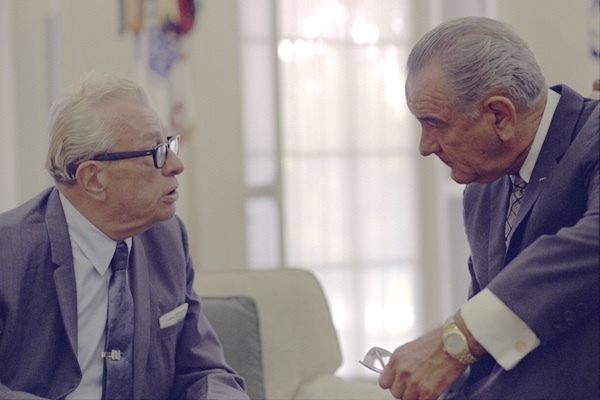 When Johnson was President, he was the true master of how to deal with and gain the full backing of opposition members of Congress, most notably Republican Senate Minority Leader Everett Dirksen of Illinois, who regularly visited the White House. Dirksen was promised patronage jobs in return for the support of major legislation, most specifically the Civil Rights Act of 1964; his help was vital in overcoming the Southern Democratic filibuster in the US Senate. Dirksen remained a sharp critic of the President, but at the right time and events, came to his rescue and made LBJ the supreme legislative master that he was. Ronald Reagan fought “tooth and nail” publicly with Democratic Speaker of the House Thomas “Tip” O’Neill of Massachusetts over many issues, but when it came to the need for a long-range plan for the survival of Social Security, the two men managed to work well together, and get the necessary legislation adopted in 1983. Just like LBJ and Dirksen, Reagan and O’Neill would have a few drinks, laugh about their vehement criticisms of each other, and then get to work and accomplish the goal of major legislation. Bill Clinton may have fought vigorously against Republican Speaker of the House Newt Gingrich in the mid 1990s, but several important pieces of legislation were passed through their collaboration, including welfare reform, the end of the Interstate Commerce Commission as a federal agency, and deficit-cutting measures. They also worked together to pass the State Children’s Health Insurance Program (CHIP), a program which Hillary Clinton was always proud to declare her own; the deal for CHIP came about in 1997 as part of a deal for a balanced budget. While in the hindsight of history many criticize the loss of a national welfare standard and the demolition of the ICC, it was still amazing that two men with strong egos and very different motivations were able to pass significant legislation (legislation that actually helped reelect Clinton to his second term in 1996). It is also now known that had the Monica Lewinsky scandal not emerged in 1998, it is possible that there would have been a plan adopted to reform both Social Security and Medicare. The question now in 2017 is whether Democratic Senate Minority Leader Chuck Schumer of New York will be able to work with the new President, Donald Trump. They share a common New York background, but hold to very different agendas. Will there be a “grand bargain” between Trump and Schumer, as occurred with FDR and Norris, Truman and Vandenberg, Ike and Rayburn/Johnson, LBJ and Dirksen, Reagan and O’Neill, and Clinton and Gingrich? Stay tuned over the next four years of the Trump Presidency, keeping in mind Trump’s concept of “the art of the deal.” It is possible that Schumer, with his great talents as a politician, might be able to “humanize” Donald Trump, and have a greater impact on policy than the congressional Republican leadership. At the least, it will be far from boring to see the Trump-Schumer relationship evolve.